Our freezer crapped out a couple of weeks ago. I woke up in the middle of the night to the incessant bleeping of a temperature alarm, and over the next 24 hours we watched the temperature slowly rise. Minus 11, minus 8, minus 5… the slow but inevitable thawing of all of our baking, all the tiny little toddler meals I’d stashed away for Niko, and a couple dozen individually portioned freezer meals. We waited eight days (eight days!) for a technician to come in, eight days with a freezer thoroughly emptied, cleaned out, and turned off, and when they finally did come it was fixed in under 10 minutes; some small electrical part simply replaced. I hate wasting food, so when it became clear that we were going to have to consume or lose everything, I put out a call for help to my office and schlepped in packed lunches for 15 people. Little foil-wrapped packets of lasagna and strata, containers of soups and curries (this curry, which might be the post popular recipe on this site), ziplock bags of spicy black beans that were perfect on toast with a side salad, and vegetarian chili. In the end all of the meals were eaten, and we only had to throw away dripping bags of frozen berries and other freezer flotsam that we just couldn’t put to use fast enough. In the absence of my trusty freezer meals, I had to come up with a few quick and easy meal ideas on the fly. A quick business trip to London thrown into the mix, meant coming home late, tired, and void of a packed lunch for the next day, so I (*gasp*) bought my lunch a couple of times, which was nice and fun and tasty, but not something I want to make a habit of. Of all the quick fixes there was this: ramen. And I don’t mean the posh kind with fresh noodles and lovingly home-made broth. Nope, this is instant ramen complete with one of those little plastic-wrapped flavour packets, but fancied up. I got on the instant ramen train after trying Roi Choi’s perfect instant ramen, which includes an barely-cooked egg poached right in the broth, and a slice of American cheese melted over the top. Throwing a processed cheese slice into your ramen sounds weird, right? But man oh man is it ever good. But, this is The Muffin Myth and I am not Roy Choi, so we’re going veggie loaded here. I used bok choy, shelled edamame, scallions, cilantro, and sliced chiles, all of which lightly cook in the broth with the noodles. I have also done an egg, but frankly the just barely cooked egg thing kind of squigs me out, so instead I did a six-minute soft-boiled egg, which I cooked in a separate pot alongside the ramen. It’s an extra dish to wash, yes, but it doesn’t add to your cooking time whatsoever. For me the step of soft-cooking the egg separately is fully worth it for getting the perfect (to me) egg texture of a well-cooked white and a medium-soft yolk. A note on the vegetables: in these photos I’ve sliced the boy choy lengthwise, but that’s because I wanted to style this particular bowl of ramen to take photos of. I find bite-sizesd pieces are easier to eat, however, and if I hadn’t of been taking photos I would have chopped all of the veg up like so. Also, you can really choose your own adventure with the veggies you include. I also love snow peas, baby corn, broccoli florets, spinach leaves, and bean sprouts tossed in with the hot broth. It’s such a quick and comforting meal, and one I look forward to after a long day at the office. I hope you like it. Bok choy, also known as pak choy, is a member of the brassica family which also includes broccoli, collard greens, and kale. 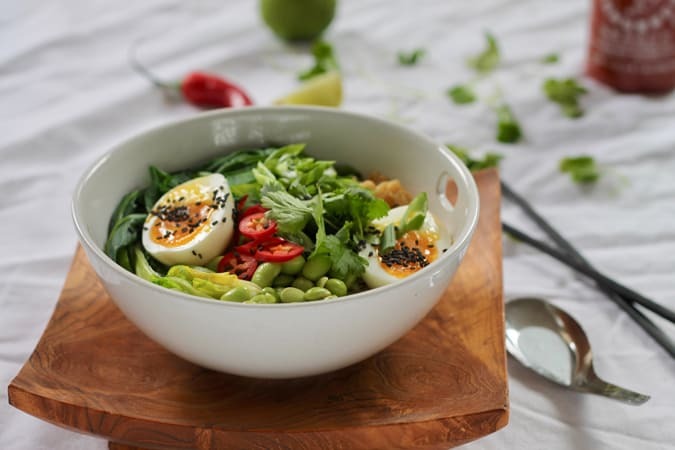 Pak choy is host to a number of antioxidant nutrients including vitamin C, carotenoids (a pre-curser to vitamin A), manganese, and zinc, as well as a range of phytonutrients. There are also many anti-inflammatory nutrients in pak choy, including the omega-3 fatty acid alpha-linolenic acid (ALA) and vitamin K. Pak choy, like other cruciferous vegetables, are a good source of glucosinolates – unique sulfur-containing compounds that have been shown to have cancer-protective properties. It’s also a good source of potassium, folate, vitamin B6, calcium, iron, vitamin B2, phosphorus, and dietary fiber. 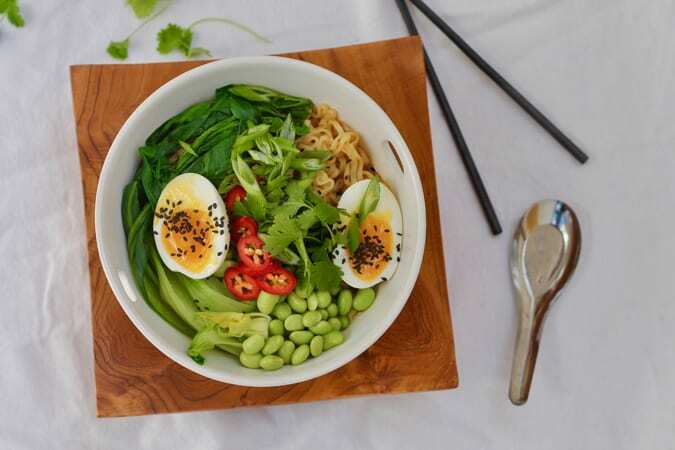 This quick and easy veggie-loaded bowl of ramen is as delicious as it is comforting. Fill a small pot with cold water and set it over high heat. When it comes to the boil, dip the egg in and out of the water a few times to let it adjust to the temperature. Then fully submerge the egg, and set a timer for six minutes. In a medium-small pot, bring 2 cups (500ml) water to the boil. 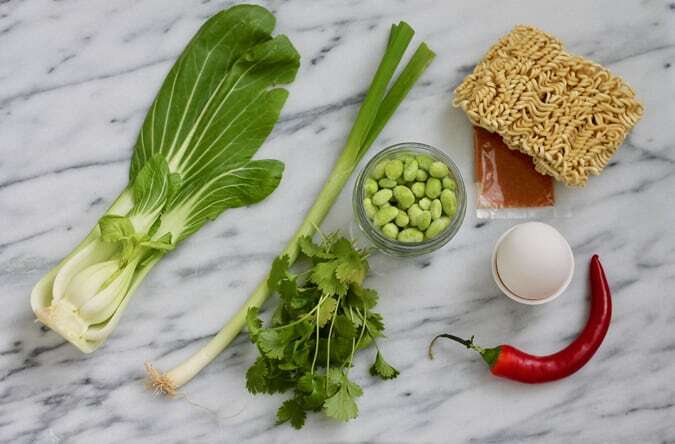 Add the noodles, the contents of the flavour packet, bok choy, edamame, and chiles. Let cook for 3-4 minutes, stirring to break up the noodles. When the noodles have softened remove from the heat and transfer the noodles, vegetables, and broth to a bowl. When the egg timer goes off, remove from heat and run the egg under cold water for 30 seconds or so, so it's cool enough to handle. Lightly tap the shell to break it, and carefully peel the egg. Slice in half and place yolk-side up on top of the noodles. Garnish with sliced scallions, cilantro, and a sprinkle of black sesame seeds. OK, instant ramen is one of my guilty pleasures. How have I never thought to add veggies before? What have I been doing my whole life? This sounds awesome! And with added veggies I don’t have to be quite so guilty when I eat it :). That’s my kind of dinner! I think the veggies totally cancel out the unhealthiness of the noodles! 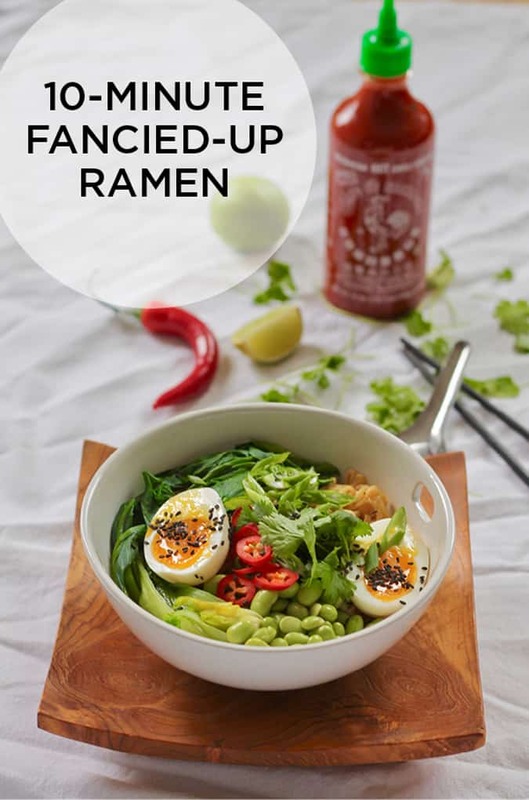 Fancied up ramen is the only way to eat it, I think. I’m not sure I could do just the bowl of noodles and packets of seasoning (too stodgy). I scrabble about doing a fridge clear out and add any old vegetable for ramen days. Ones I”m sure have never been seen in Asia 😉 I haven’t had quite the freezer drama that you have had but if it doesn’t happen I will a) rally the work troops to eat my freezer; b) fancy up my ramen! I’m with you about eggs. They need a little more cooking than introduced to broth for me to eat it. But i Love eggs. Fasting today so I really shouldn’t be commenting on food blogs such as yours! Painful! What brand of instant ramen do you recommend? I live in Sweden so I’m assuming that my ramen brand isn’t local to you…it’s called Taste of Asia and it’s surely terribly inauthentic. I recommend hitting your local Asian market and trying a few different kinds until you find one you like. 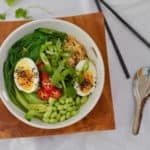 I never liked ramen as a kid, but now I love veggie noodle bowls. I will have to shop for ramen and see what I can find!! Thanks! 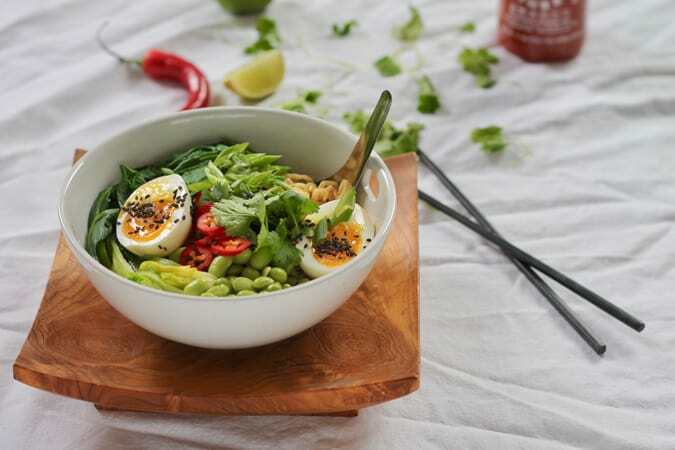 Noodle bowls are the best! These look delicious, so easy and so bright and colourful! Instant Ramen is now on my shopping list! 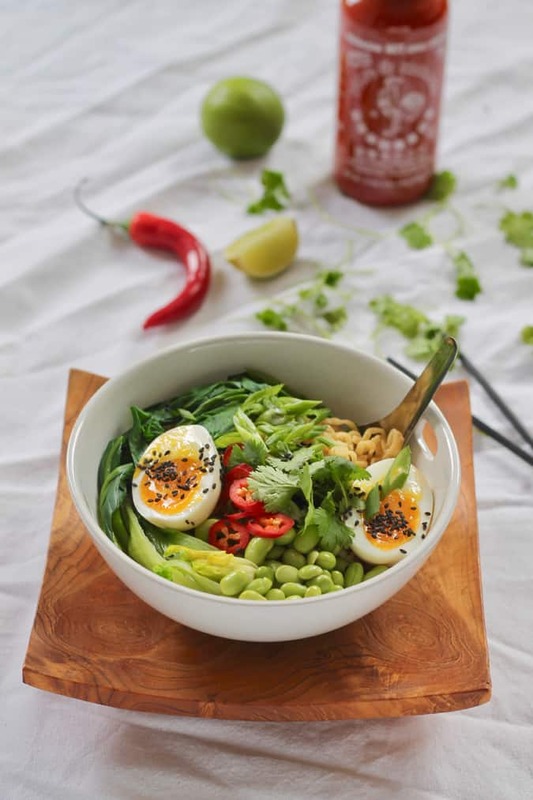 Isn’t it amazing how a few veggies can brighten up a humble bowl of instant ramen?! Hi, great recipe however although I haven’t checked the ingredients lately I’m wondering what’s in the broth package. I seem to be sensitive to a lot of added flavour enhancers, etc. It would vary from brand to brand. I recommend you read the labels carefully and find a ramen brand that doesn’t contain the ingredients you’re sensitive to. Or, leave the flavour packet out and replace with veggie broth, miso broth, etc.